The Michigan Duck Hunters Association (MDHA), in cooperation with the Michigan Department of Natural Resources (DNR), has introduced the 2013 collector-edition Michigan duck stamp and prints. 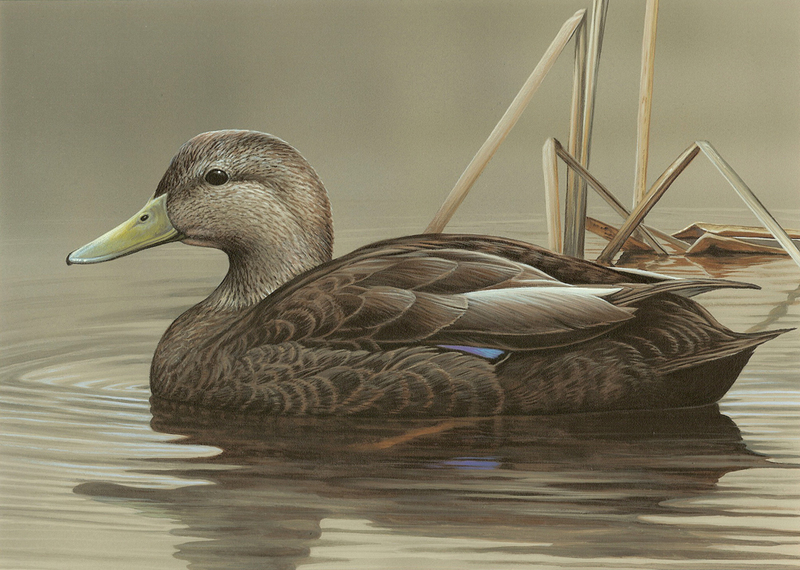 The 2013 Michigan duck stamp, by wildlife artist Richard Clifton, features a beautiful black duck displayed in a swimming pose. For information about pricing and how to order duck stamps and prints, see Michigan waterfowl stamp order form, available online at www.michigan.gov/waterfowl (click on the Waterfowl Stamp Program link). Proceeds from stamp and print sales will be used to fund MDHA projects, with 10 percent used to match DNR funding for purchasing wetlands. "The waterfowl stamp program is a valuable partnership between the DNR and the Michigan Duck Hunters Association, and helps ensure continued acquisition of wetlands and programs to improve habitat," said Barbara Avers, DNR waterfowl and wetland specialist. "Buying stamps and prints is a great way for waterfowl hunters and others to contribute to wetlands conservation." Purchase of these collector-edition stamps is voluntary and does not replace the state waterfowl hunting license. MDHA will mail those who purchase a 2013 waterfowl hunting license a free copy of the stamp (subject to availability) if they send a self-addressed, stamped envelope with a copy of their Michigan waterfowl hunting license to: Michigan Duck Hunters Association, Waterfowl Stamp Program, P.O. Box 20, Midland, MI 48640. Established in 1976 and coordinated by the MDHA in partnership with the DNR, the Michigan Waterfowl Stamp Program has become an icon for waterfowl hunters and wetland conservation enthusiasts. During the past 31 years, the program has gained popularity with collectors and conservation groups throughout the United States. 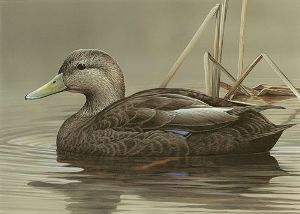 Richard Clifton is a self-taught wildlife artist who has painted 30 duck stamps for various states, as well the 1996 Australian duck stamp and the 2007-2008 federal duck stamp. MDHA is a non-profit organization dedicated to waterfowl and wetland conservation. To learn more, visit www.midha.org. The announcement of the 2013 waterfowl stamp continues the celebration of the Michigan Waterfowl Legacy (MWL) “Year of the Duck.” The MWL is a 10-year, cooperative partnership to restore, conserve and celebrate Michigan’s waterfowl, wetlands and waterfowl hunting community. For more information about MWL, please visit www.michigan.gov/mwl. /Editors please note: An accompanying image is available for download below. Tip of the week: Find out where the fish are biting! Get the Weekly Fishing Report sent to your inbox every Thursday morning. Click on "Manage Subscriptions" below to sign up.